We're counting our blessings, one by one, How many will there be? Let's count together, just us two And very soon we'll see. A charming new concept book from Emma Dodd, combining a counting element w ith a celebration of w hat is important in life, from a home full of love to the... read full description below. 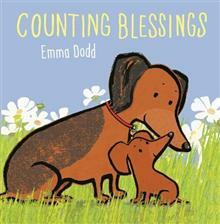 We're counting our blessings, one by one,How many will there be?Let's count together, just us twoAnd very soon we'll see.A heart-warming new concept book from Emma Dodd, combining a counting element with a celebration of what is really important in life, from a home full of love to the blue sky above.An original and life-affirming book from the best-selling Emma Dodd. Emma Dodd has published a host of b ooks to critical acclaim, including I Love My Mummy, which won the Booktrust Early Years award, and the Amazing Baby (R) books. She has been the 123rd most borrowed author from UK libraries in any genre.